SIOUX FALLS, South Dakota—The hood of an old Volkswagen Beetle on the body and the VW insignia on its tail, ‘Beetle the Bear’ is apparently as loveable as Herby The Love Bug in his day. 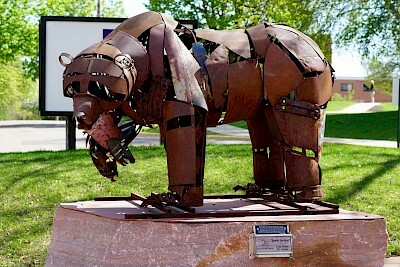 The sculpture was just voted the University of Sioux Falls’ annual People’s Choice Award for its SculptureWalk contest. Alberta, Canada-based artist Cedar Mueller is Beetle’s creator. USF’s SculptureWalk tradition began in 2011, and since then every fall, students, faculty and staff celebrate campus’ sculptures by voting for their favorite and honoring the respective artist with the People’s Choice Award. USF SculptureWalk is a partner of the downtown Sioux Falls SculptureWalk and currently displays 11 unique sculptures that are owned by world-class artists and are on loan to the exhibit for one year. Each spring, new sculptures are selected for display, and many actually come from the downtown exhibit. The USF SculptureWalk also features eight permanent sculptures. Grounded in the liberal arts tradition, USF values the development of students’ intellectual, analytical and creative capacities and seeks to cultivate students’ knowledge and appreciation of the visual and performing arts. The USF SculptureWalk fosters creativity and enriches the campus community giving students a fresh approach to learning. View all of this year’s sculptures at www.sculpturewalk.usiouxfalls.edu. A growing, transformative university committed to academic excellence and the development of mature Christian persons for service to God and humankind in the world, the University of Sioux Falls offers more than 90 undergraduate programs and adult and graduate offerings in business, degree completion, education and nursing, as well as the Center for Professional Development. For more information about USF, visit www.usiouxfalls.edu.